At the end of August Vroon took delivery of VOS Champion in China. The vessel left Fujian Southeast Shipyard (FSES) last week at the start of her journey to Thailand. 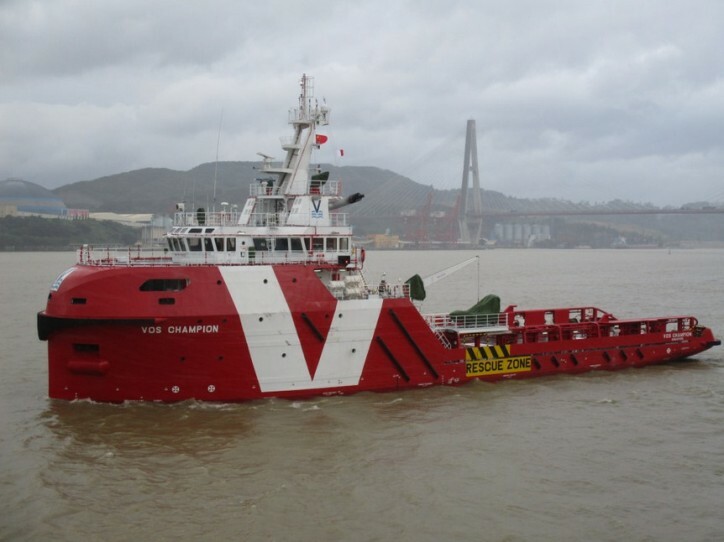 VOS Champion is a 65m anchor-handling tug supply (AHTS) vessel and one of an exciting new series of six such vessels under construction at the Shipyard for Vroon. She is a KCM 65m vessel, designed by Khiam Chuan Marine. Vroon’s Performance and Engineering Department worked closely together with KCM to enhance vessel capabilities. VOS Champion is equipped with DP2 capabilities, 425m2 clear deck area and anchor-handling/towing winches of 1,500m x 64mm. The vessel is SPS2008-compliant, comes with super-silent bow thrusters and an optimised hull design for improved fuel efficiency. She boasts 39 beds for crew and personnel, with impressive noise and vibration insulation levels ensuring on-board comfort.